With FaceTime on Apple’s new iPhone 4 getting some pretty great reviews, Adobe has stepped up with a solution for peer-to-peer video calls on Android devices. 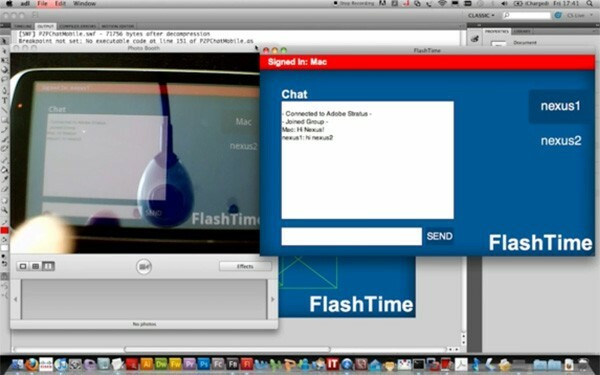 The demo software shown in the video embedded below is being dubbed “FlashTime” and is built with Adobes upcoming Adobe Air 2.5. The peer-to-peer video chat client will allow you to access direct visual connections with other Android users, and since its Flash and Adobe, it will presumably be ported to other platforms in the near future. The video demo below also shows a multi-peer chat with a desktop application on Mac OS X as well. As of yet there are no plans for a release date, and the “FlashTime” moniker is simply a working title. There are other options available to Android users such as the $5 a month Qik video chat service shown in the video below. Consumers are going to really benefit from the new feud between Apple and Adobe. Facetime vs Flashtime.